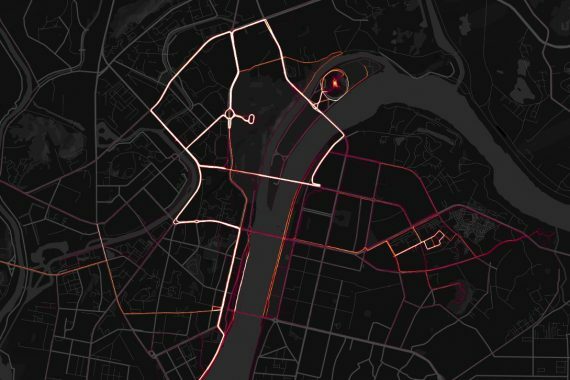 Strava’s heat map of user activity has been raising some eyebrows for detailing movement of people around military bases, but what does it tell us about North Korea? As you might expect, there isn’t a whole lot of activity in the country. 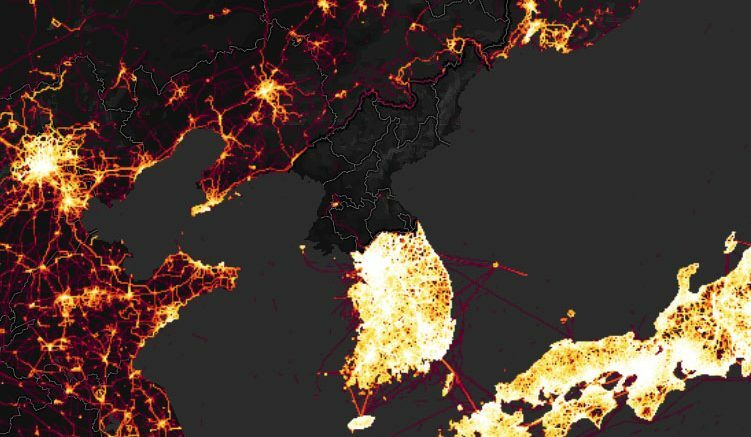 In fact, alongside South Korea and China, the image of North Korea looks remarkably similar to NASA’s famous satellite picture of the Korean peninsula at night. 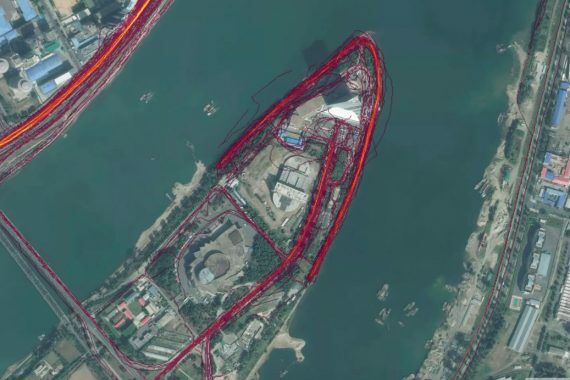 Strava is a smartphone app that tracks fitness using the sensors in a phone or wrist-worn fitness tracker and relies on a GPS location and Internet connection. Lots of North Koreans have access to smartphones but they don’t have access to Google’s app store to grab the app. And even if they get the app, the lack of an Internet connection means data cannot be uploaded so it’s no surprise there isn’t much here. But there is some. The majority appears to be from visitors and resident foreigners. 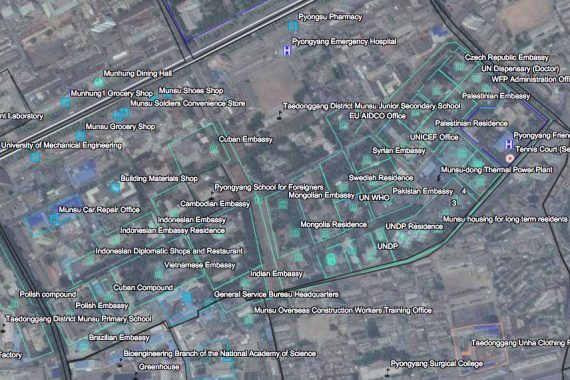 Here’s the heat map for downtown Pyongyang. 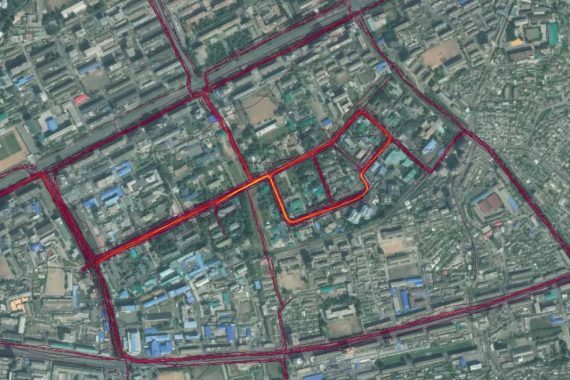 Strava is measuring what it interprets to be walking, running and cycling movement – not driving – so the map starts to make a little more sense when you compare it with the course of the Pyongyang marathon. All of the white-hot parts of central Pyongyang are roads that have been used for the marathon. The marathon typically starts at Kim Il Sung Stadium, near the center of the map, but in 2016 used the May Day Stadium, which is the circle on island. As Strava is presenting aggregated data from several years of activity, it makes sense that the different marathon courses are represented. Beyond the marathon course, there’s a lot of activity in the eastern part of the city around a few city blocks. That’s the diplomatic neighborhood of Pyongyang, home to the lots of embassies, the foreign school, United Nations offices and the foreigner hospital. Interestingly, there isn’t much activity shown around the Koryo Hotel in downtown Pyongyang. Looking outside of Pyongyang and there are a few, faint paths of activity at tourists spots. There’s a long track winding all the way down to Panmunjon and another to Wonsan. The routes don’t appear brighter because much of the tourist traffic on these roads will have been discounted by Strava because it was by car or bus. At Panmunjon we can see visitors with fitness trackers are much more common on the southern side, as should be expected. There’s also a curious track that appears to be someone crossing the border and heading back. I suspect this is a bad GPS location that momentarily put someone in North Korea. Elsewhere, we see a trip down to Nampo that apparently stops at Pyonghwa Motors factory and returns to Pyongyang; people making good use of the parks in and around Pyongyang; a visitor to the Paeksong Revolutionary Site, the Chilbo Homestay Village and one to the Majon Bathing Resort in Hamhung. 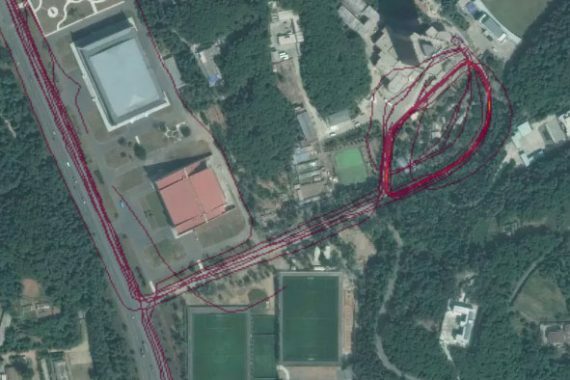 There’s also activity along the sea in Wonsan … but Strava tracks leading us to super-secret military bunkers? Not so much. There are no tracks around the Songhae satellite launch station and nothing of interest at the Punggye-ri nuclear test site. 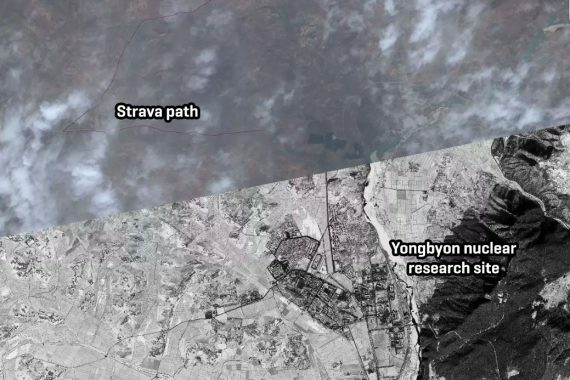 North Korea’s nuclear reactor site at Yongbyon does feature something curious: A track that starts, or finishes, on a road just a few hundred meters from the outer security perimeter of the nuclear research site. It travels along the road away from the site for a short distance then turns onto another road that goes into the hills north of the site. It stops about 11kms north of the site but, as the road follows a river, restarts again and then, at a fork in the road, goes left and ends. Another path can be found a little along the right-hand fork in the road all the way to the nearby town of Unsan. It’s difficult to know what to make of these paths. The breaks and ends are likely due to spotty GPS or cellular reception, so it’s also possible these paths didn’t stop or end at the places mentioned at all. That could just have been where the last good location was received. 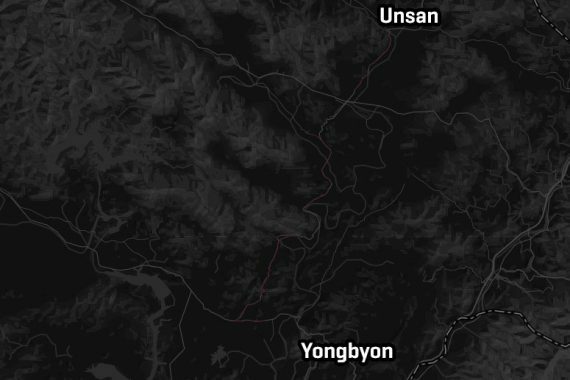 Assuming the Strava user is a foreigner, it could be a diplomat or aid worker in the countryside, a tourist (although this is pretty deep inside the country) or, if Yongbyon is indeed the destination, an overseas researcher visiting the country. 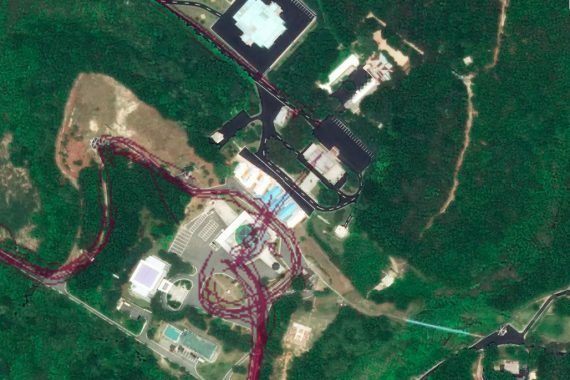 Unfortunately it’s impossible to know the identity of the user or even when this was recorded but the data isn’t present on a map published by Strava in 2015. 4 Comments on "What does Strava data tell us about North Korea?" was really fascinating to see all this activity mapped to the types of locations. thanks for the writeup. Are there any paths close to concentration camps? The path on the coast is Chilbo Homestay Village. The one above it and to the left appears to be Chilbosan Hotel.